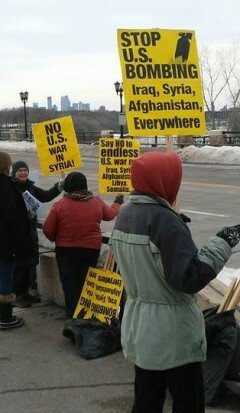 Twin Cites peace vigil speaks out against U.S. intervention in Syria | Fight Back! St. Paul, MN - About 25 people joined a peace vigil on Wednesday, April 18 in the Twin Cities to speak out against the U.S. attacks on Syria carried out last Friday evening. The vigil was held on the Lake Street/Marshall Avenue bridge over the Mississippi River between Minneapolis and Saint Paul from 5 to 6 p.m. The vigil is held weekly and is sponsored by the End War Committee of Women Against Military Madness and the Twin Cities Peace Campaign. The organizers focus on various issues each week and adapt the event to major news developments. In addition to the recent airstrikes, the U.S. has over 2000 troops in Syria and carries out regular air and drone attacks using the pretext of fighting the Islamic State. The escalation of strikes against Syrian targets could lead to possible confrontation with Russia. A statement by organizers notes, "Last Friday the Trump administration launched air strikes against Syria government facilities. These strikes, carried out in response to allegations of Syria chemical weapons use, only make the world a more dangerous place. "U.S. military intervention is not intended to help people, or to resolve internal conflicts of nations in a humanitarian manner. U.S. intervention only serves the interests of the U.S. elite, who care nothing of Syrian people or the people of the Middle East," the statement added. The statement continues, "The U.S. government has carried out an endless series of wars and intervention for many years in Iraq, Syria, Yemen, Libya, Somalia, Afghanistan, Pakistan and elsewhere. This new escalation will only lead to more dead, injured and displaced."